The Moorish Science Temple of America is a sect of the Islamic religion that teaches the uplifting of fallen humanity and the making of better citizens. Symbols of this religion include the star and crescent, fezzes, turbans, the Moorish Flag, and the addition of “El” of “Bev” to the surname. 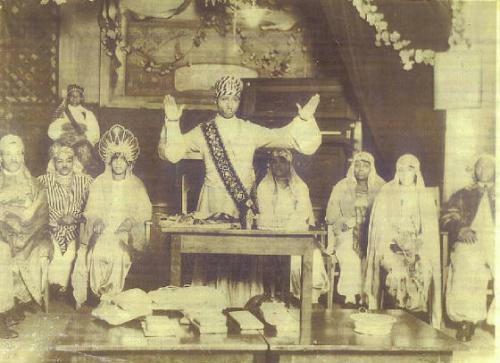 This sect was started by the prophet Noble Drew Ali who was born in 1889 in North Carolina. Ali claimed he was sent to redeem the Moors of America from their sinful ways. The Moors of America were defined as descendants of northern Africans. He preached the importance of being one’s self, how to be better citizens, and to uplift fallen citizens teaching them to be attributes to the government. He also taught the importance of racial pride. The first temple was founded in 1913 by Noble himself in Newark, New Jersey. Shortly after Noble moved to Chicago, Illinois where he called on his followers to love and not hate. They would be capable of this love only by recognizing their higher selves. It is believed that during Ali’s lifetime the membership of the Moorish Science Temple may have reached nearly thirty thousand people. Although they preached and taught members to be supportive of the Federal government, they in fact had numerous difficult encounters with Federal agencies. For example, in 1940 the Federal government investigated whether the Temple was spreading Japanese propaganda among African Americans. These investigations failed to find any member to be pro-Japanese. In 1953 the FBI investigated the Temple because they believed the leadership encouraged the violation of the Selective Service Act. Later the Department of Justice decided that the prosecution was not warranted. After the death of Ali in 1929, the sect lost popularity and most of its members withdrew. Nonetheless there are still many small temples scattered across the U.S. teaching the words and beliefs of Noble Drew Ali. http://www.moorishsciencetempleofamericainc.com; http://vault.fbi.gov/Moorish Science Temple of America ; Susan Nance, “Respectability and Representation: The Moorish Science Temple, Morocco, and Black Public Culture in 1920s Chicago,” American Quarterly 54:4 (winter, 2002): pp. 623-659.